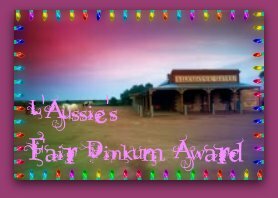 Mysti over at Unwritten listed me for the Fair Dinkum award. Now I am obligated to share five facts about myself and nominate five people. Off we go, then. 1: I am incredibly lazy. I won’t join a gym for that reason. I am a programmer by training, and will often write a script to do things (like convert a directory full of .tiff images to .jpg) because I don’t want to go through the process of click, click, type, click, click 75 times. 2: I am terribly disorganized in most aspects of my life. 3: I am ridiculously organized (or getting there ) when it comes to writing and programming. I am using the snowflake method as closely as I can for my next story, and when your programs have a potential to cause serious injury or death, you make sure you are careful with that, too. 4: I have been to three countries, technically. The US (where I live) Canada and Mexico. Canada was nice. I didn’t enjoy Mexico. I was in Monterrey for two weeks, and it rained the entire time. All trips were work related. 5: I happily got rid of my iPhone 3GS and replaced it with a Droid2. I am still happy with that decision. 1. Shawn over at Light’s Fury. He got me interested in writing my first sad little Warcraft related blog. He is much better at this than I. 2. EJ Ruek at The Grimace and the Giggle. She has been away for a bit on personal business, but was one of my harshest critiquers. When she told me that my main character was “contemptible” I knew it was out of love. 3. Stephanie Jones at Across the Border. She’s pretty new, but has already caught my eye as a blog that I enjoy and hope continues. 4. Andrew, who brings us Aquatic Eden. Someday my 100 gallon tank will look as cool as his stuff. Erm. I think I will cheat and stop there. Everyone else that I can think of to nominate already has the award. If I missed you, complain and I will put you in here. There are a few people that I would nominate if they had a blog, but they don’t (that I know of) so that’s that. ‘Till next time. Thanks for reading! Yey! My first nomination for blog stuff! Thanks a ton!